Above images shows completed ZIF Programming bundle with all components soldered. UASASP programmer shown in images is sold separately. 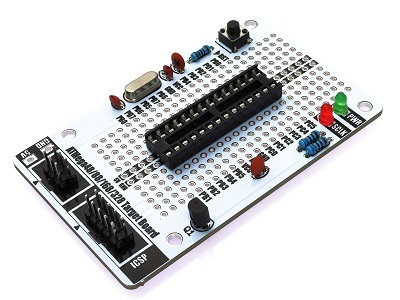 This prototyping/programming board is designed for use with the Atmel ATMega48P, ATMega168P, & ATmega328P microcontrollers. The board has a number of features including a 24x12 0.1" grid prototyping area specifically laid out to match the pin-out of these devices. 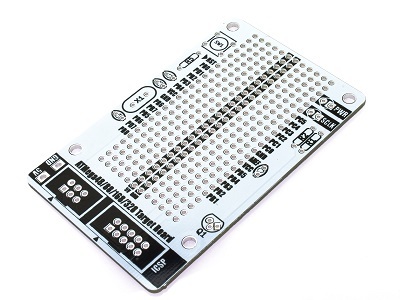 Additional pads are also provided for optional components such as external crystal, reset button, LED, ICSP headers and these are all connected to the appropriate pads within the prototyping area. The 6 and 10 pin ICSP headers are compatible with most common ICSP programmers such as the USBASP (see HCDVBD0031) and USBTiny (HCARDU0002). For the prototyping and ZIF programming bundles all components are deliberately chosen to be through-hold for easy construction (components in these bundles will require soldering). 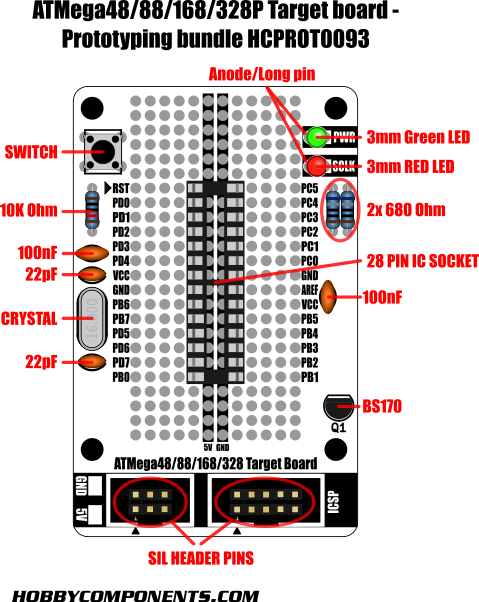 Just the PCB, for use as a basic prototyping board where you can add your own components. Trying to upload to the chip with the ZIF bundle gives the following error: An error occurred while uploading the sketch avrdude: ser_open(): can't open device "\\.\COM5": The system cannot find the file specified. Programming a chip via the USBasp/Target board has to be done in a slightly different way to programming an Arduino board. As the the chip is blank it doesn't yet contain the Arduino bootloader (a program normally pre-installed into an Arduino that allows it to accept sketches via it's serial port) and as a result you can't upload a sketch via it's serial interface. This will tell the Arduino IDE what version of bootloader you wish to program into the the device and for what type of device to compile your sketch for. 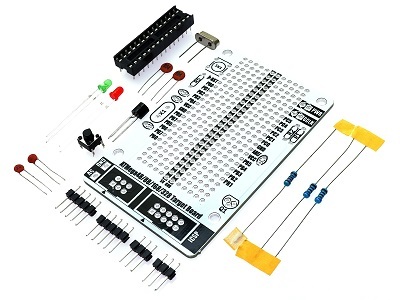 For this you must choose an Arduino board that has the same type of device you're attempting to program. E.g. for an ATMega328 you could choose, Uno, Nano, Pro Mini, etc. 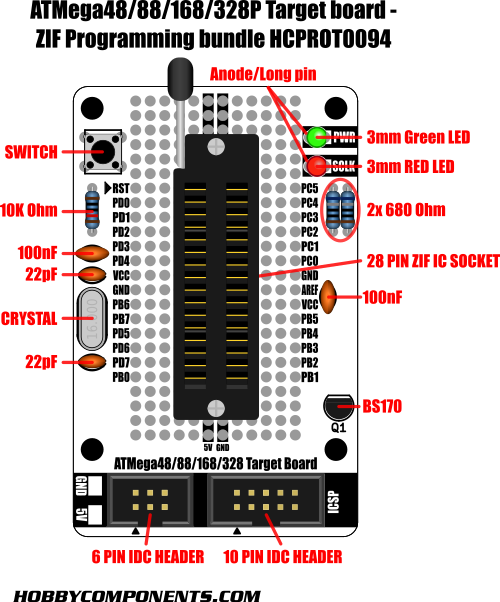 If you are just wanting to program the device to use in your own project then I would recommend selecting 'Nano' as the board type and 'ATMega328p' as the processor. Simply select Tools->Burn bootloader. This will burn the bootloader for whatever board type you have selected. Note that burning the bootloader is only necessary if you are programming the chip to replace a device in an existing Arduino board, or you'll be using the device in you're own project but want the option of uploading sketches via it's serial interface. Hold down the shift key on your keyboard and then click the upload button (round green icon with right pointing arrow found in the top left corner of the IDE) as normal. Notice as you hover over this button the IDE now says 'Upload using programmer' whilst the shift key is held down. The Arduino IDE should now upload the sketch via the programmer. Libraries, example code, and diagrams are provided as an additional free service by Hobby Components and are not sold as part of this product. We do not provide any guarantees or warranties as to their accuracy or fitness for purpose. I have a question: is AREF connected to Vcc or can I connect my own Vref. AREF isn't tied to VCC so you can connect it to your own reference voltage. Another question: Why is there a FET and a LED on SCKL? If used as an Arduino this pin would be digital pin 13 which normally has an LED connected to it. OK, but normally a resistor is enough. Or is it better to use a resistor and a FET ( or an 2N2222 )? The loading effect caused by just using an LED and resistor can cause problems with some types of ICSP programmers (which of course also use this pin for the clock signal). 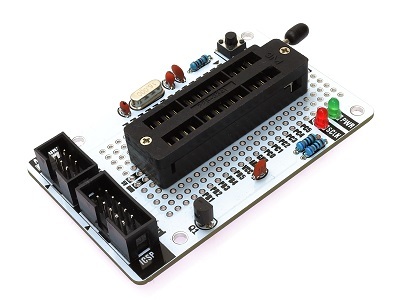 This would be a particular issue for this board as it's designed to be used with this type of programmer. 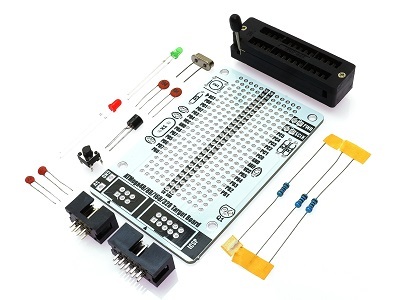 This is a very nice board to build your own Arduino. I suspect this board can also be used to program other AVR devices if the pinout of the ZIF is adjusted to suit? I have in mind the ATTiny861A which I currently program successfully using raspberry Pi GPIO with avrdude. The ATTiny devices are supported in Arduino via the ATTinyCore extension by the way. It would be nice to 'go direct' using USBASP instead of moving hex files about. 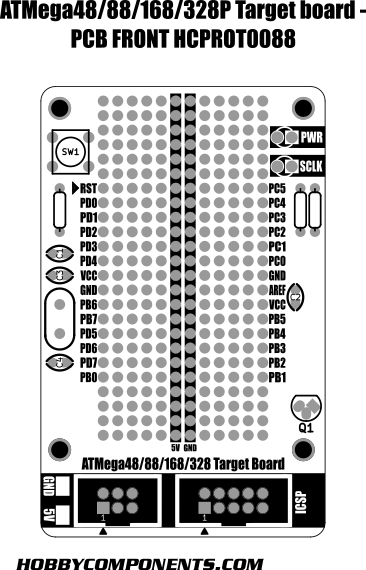 I have in mind to make an 'adaptor ZIF' socket that plugs into your on-board ZIF, but has it's programming pins rewired to two rows of SIL header pins such that these match the ATMEGA328 pinout. Do you think this sounds feasible - have you heard of others doing it this way? 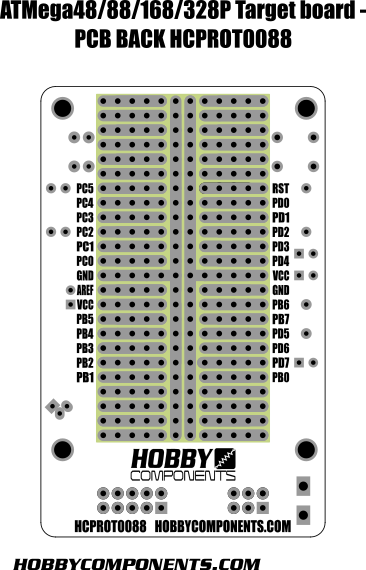 I will probably also use this board for the intended devices in the near future, so I don't want to actually modify the board (thus the home-brew adaptor). I suspect this board can also be used to program other AVR devices if the pinout of the ZIF is adjusted to suit? I have in mind to make an 'adaptor ZIF' socket that plugs into your on-board ZIF, but has it's programming pins rewired to two rows of SIL header pins such that these match the ATMEGA328 pinout. Yes, I don't see a problem with this. You could just cut the tracks on the underside of the board and reroute them but as you said you don't want to modify the board so making a mezzanine adaptor should work fine. I've not heard of anyone doing it for this kit but some general purpose programmers work in this way - they have a fixed pinout ZIF socket which you then plug in an adaptor board specific to the device you wish to program.